This compact, sophisticated filter unit combines the function of two filter units; a dual pod bag filter unit and dual pod cartridge filter unit. 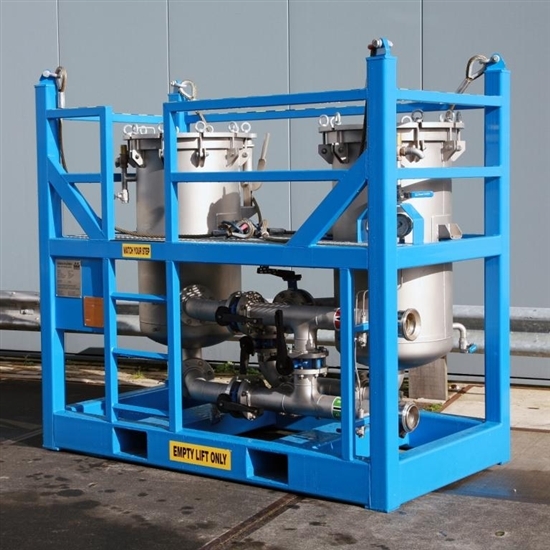 The unit allows pre-filtration, and polish filter with bags or cartridges, within one unit. During the cartridge operation, the baskets and basket plate can be stored in a special storage rack in the unit. The Duplex filter unit has the capability to use standard filter bags as well as standard plug-in cartridges. Standard TDW 610 type: 50 cartridges and or 4 bags per vessel. Storage racks for all baskets and bag top plates. All 4 inch valves easy to operate. Safety valve set at 7 bar (105 Psi). ASME Vlll / DNV / TUV / Stoomwezen certified. Other manifold size and connection types. Vessel linings: rubber, epoxy, glass flake, PU.